An unusual evergreen ground cover plant, Lotus berthelotii is commonly called ‘Parrot Beak’. A trailing plant with silvery grey green foliage and brilliant red or ‘Fluro’ orange flowers it is a great plant for hanging baskets. 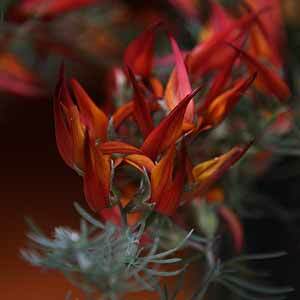 Lotus berthelotii also works well when grown along a retaining wall and allowed to cascade over the edge. A very hardy plant once established, it does require a well drained soil and needs a frost free position to thrive. Originally from the Canary Islands, it grows well in an open free draining potting mix. A succulent or fine orchid type potting mix will usually be suitable. Flower colour tends to vary a lille, most are red to orange, however some are a more scarlet red. Over time Lotus berthelotii or ‘Parrot Beak’ will reach around .4m in height, however it will trail and spread over 1.m – 1.5. Best grown in full sun to a little afternoon shade.